The Academy’s facilities are designed to prepare you for a career in the industrial design industry. Our hands-on learning environment in our industrial design workshop creates a culture that supports curiosity, investigation, and production. Online students are also hands-on, as they engage in discussions and activities through the online platform, social media, and real-time streaming of our events. Both online and onsite studio environments are equipped to give you the skills you need to create the industrial design career of your dreams. 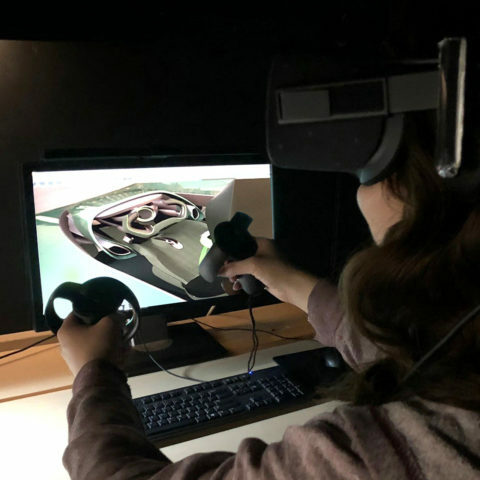 The 3D printing lab is a great place for students to experiment with physical form to prototype cutting-edge wearables and other alternative physical interfaces. Both small-scale and oversize 3D printing is available for presentation, mock-up, and display. Students can provide files for visualizing ideas both flat and form-based. The metal shop expands students opportunities to realize their projects and explore the potentials of different material expression and technique. Students can learn a variety of metal fabrication processes. Craft precision metal parts in our full featured metal shop. Machine lathes, milling machines, disc grinders, rollers,and formers are all at your disposal. With a custom-built negative pressure spray booth large enough to hold a full-sized automobile, discover one of the best-equipped painting facilities in the county. Fabricate objects and jigs in both natural and artificial wood in our wood shop. Work with band saws, drill presses, jointer, planer, miter saws, panel saw, wood shapers, and table routers. Two wood lathes and two isolated sanding rooms with spindle and disc sanders and one more lathe for working foam plastics give you the control to polish your designs. The wood shop also features four SawStop table saws as part of our ongoing commitment to safety. Our in-house lab technicians will be able to assist you with the high-resolution printing of your large-format presentation boards using these cutting-edge printers. You will use the latest software packages on regularly updated Dell computer workstations connected to Wacom Cintiq interactive pen displays. The Academy of Art University Automobile Museum presents a tantalizing glimpse into the history of the art and design of automobiles. Displaying cars from this expansive collection, the museum preserves an integral piece of international automotive culture.